Linville Gorge Waterfalls - Take a Hike! This past weekend, Sandy and I headed to the mountains for some waterfalls. I had recently gotten the new edition of NC Waterfalls by Kevin Adams and we wanted to get some new ones from the new book. 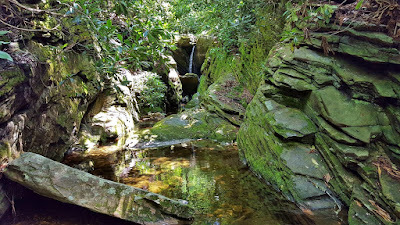 We originally planned to head to Brevard, “Land of Waterfalls”, but all the campsites and hotels were booked solid, so we stayed in Marion and want to Linville Gorge. Saturday morning, we had breakfast at the hotel and then headed north on US-221 towards the Blue Ridge Parkway to get English Falls. We pulled off along the side of the parkway near milepost 322. From here, we walked a short ways north on the parkway past the guard rail and then headed into the woods. There was absolutely no trail and the shrubs were dense, so the going was extremely slow. We made our way down to the creek near the top of the waterfall and crossed then had to make it down past some cliffs to the base. We got around the first set of cliffs and found a very steep path down. We looped around the cliffs to head towards the base but there were more cliffs in the way. As I was walking, I heard some buzzing and realized I hit a hornets’ nest. Screaming and running, I got away with only a couple stings. This would not a be a good place for a medical emergency. We then got around the lower set of cliffs and finally made it to the base of English Falls. It’s a beautiful waterfall, though the water was a little low today. After a couple pictures, we slowly headed back up. We drove a little further on the parkway and got off at Linville Falls. This is a popular area and the parking lot was full, so we had to park along the entrance road. We started off hiking the short Duggers Creek Falls Trail. A bridge crossed the creek just below the waterfall and we could see it from here. I scrambled down to creek level for a picture. The waterfall is pretty neat – it’s small but flows through a narrow gorge. The water level was low so it didn’t look its best today. But the rosebay rhododendron were blooming all around. Next, we got on the Plunge Basin/Linville Gorge trail and first hiked over to the Plunge Basin Overlook. This is the only Linville Falls overlook that I had not been to. The overlook provides great views of the falls from high on cliff face above. Far below, we could see people swimming and relaxing around the base of the falls. After a couple pictures, we headed down into the gorge. Even in low water, Linville Falls is a spectacular waterfall. We sat on the rocks and enjoyed the view for a while, getting pictures from different angles and then started making our way back. I got a picture from further down the river with a large boulder and smaller cascades in the foreground. From here, we got on the Kistler Memorial Highway (Old NC Hwy 105) and drove south along the western rim of Linville Gorge. Near the start of the road, there were many other cars parked at the cabin and various trailheads. As we drove further south, the other traffic lightened and soon we were the only people around. We stopped at one point for great views of the southern end of the gorge. It was about 10 miles on this very bumpy and steep gravel road to FSR-106 where we turned right. We followed this road for about 2.5 miles to the end, just past a couple of radio towers. Parking right before the gate at a campsite, we continued on the gravel road for about a half-mile and turned left onto an unofficial path at a tree with light blue paint that headed down via switchbacks. We came out at some cliff faces with nice views of the Black Fork Gorge. Continuing on, it was less than a mile to Still Falls. This waterfall has a very small watershed and was essentially a wet rock. The cliffs surrounding the falls were pretty cool though. We didn’t stay long as there wasn't much to see and made our way back. Back at the car, we drove a couple more miles south on Kistler Memorial Highway and pulled off along the side of the road. Heading into the woods, we followed an old path that led down towards Yellow Fork. The hike was gradual at first, but progressively steeper. As we followed a ridge down to the gorge, we entered an open area where there was no shade. The hot sun and heavy humidity made for a strenuous hike, though it was at least short. Near the edge of the gorge, we turned left and climbed down a rickety ladder and scrambled down into the gorge at the base of Yellow Fork Falls. Like all the waterfalls this weekend, the water level was a little low, but it was still a really nice waterfall. In higher water, I think this one would be spectacular. We relaxed for a bit in the nice cool gorge and then made the strenuous hike back up. We finished up the drive through the gorge and headed back to Marion for dinner. We were both exhausted and went to sleep shortly after arriving back at the hotel. Sunday morning, we checked out of the hotel and headed towards Jonas Ridge on NC-181. Turning on FSR-228, we drove down the gravel forest road to the trailhead for Steels Creek. After getting our stuff together, we set off on Steels Creek Trail (#237). Since we were planning on doing some creek walking, we hiked in water shoes today. In about a half-mile, we came to the first crossing. Although the water level was a little low, it was just easier to wade than try to find a spot to rock hop. Across the creek, we picked up the Mountains-to-Sea Trail and hiked eastbound following Steels Creek upstream. In about a half-mile we came to the short, but steep side path that leads to a view of Steels Creek Falls. Using a rope, we were able to safely scramble out on the big rock for a couple of pictures of the waterfall and then headed back up to the trail. I've always really liked this waterfall with all the potholes in the rocks. The one in the middle kind of looked like a heart. Back on the trail, we continued for less than another half-mile and then got off the trail near a campsite and started creek walking upstream. It was less than a quarter-mile and mostly easy creek walking to the base of Beverly Hillbilly Falls. As we approached the falls, some huge boulders blocked our view. The most challenging part of the hike was scrambling up to the top of the boulders. From here it was a great view of the waterfall. After some pictures, we headed back. At the MST, we turned right and continued up the trail past the campsite and then a steep climb up a ridge on some switchbacks. Near the top, we could see Beverly Hillbilly Falls through the trees. We continued a short ways further on MST and scrambled down to the upper section of Teacups Falls. Similar to Steels Creek Falls, this waterfall tumbles down through some short drops around rocks covered in potholes, then a long slide down to a deep pool. We could only see the upper cascades and potholes from this part, so we found another path to the base. This path had a lot of briers so we had to be careful getting down. At the base, we could see the lower slide, but not the upper part with the cascades and potholes. Looking downstream from here, there were some cool cliffs and enormous boulders on the creek before the top of Beverly Hillbilly Falls. Back at the MST, we started heading back. We continued past the first crossing of Steels Creek to where the MST crosses Buck Creek. The new NC Waterfalls book indicates several waterfalls upstream, but there’s no trail, so we had to creek walk. It was a slow-going creek walk as there were a lot of downed trees and rhododendrons making the wade difficult. Although the book said the first waterfall was close to the MST, it was a little further than I expected. We went a total of about 0.4 miles and still hadn’t reached it, so we gave up and turned back. As we made the last crossing back over Steels Creek, I spotted a little toad right along the creek. After a picture, we crossed and headed back to the trailhead. Back at the car, we started driving home, making a stop in Morganton for dinner at Las Salsas.